There are three things that you must have when you start working on a Project Car: A goal, and a plan to achieve that goal, and patience. Our goal was simple, to achieve the maximum overall performance while keeping the car streetable. Our plan was to start by tweaking the brakes and suspension, then to move on to the engine, and go back to the suspension and brakes as we made the car faster. Patience is of course the most important thing. Most likely, you won’t be able to do everything over night, so you have to be willing to take your time, and we weren’t in any hurry, so that wasn’t a problem. 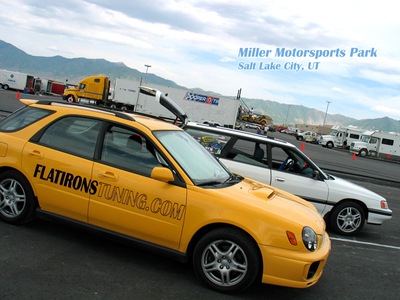 Then we got invited to participate in the 2006 Cobb Track Day at Miller Motorsports Park. We needed to get the car prepped for the track so we could at least be safe and have fun, so needless to say, our timeline got moved up. All right, let me bring you up to speed. At this point, the only parts that we had put on the car other than what you can read about in the previous installments are 22mm Whiteline Sway-Bars on the front and rear, with Endlinks to match. This gave us a dramatic improvement in handling, but we decided to go with some Whiteline Rear Camber Bolts to get some more negative camber and a Whiteline rear strut tower brace to increase chassis stiffness. This makes a big difference on the Wagon’s especially. 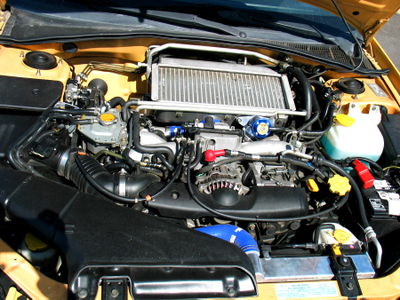 If you read part 1, you know that WRX radiators have a tendency to fail. Well, in the process of going over the car, we noticed that ours was leaking coolant from the top tank, and we had green crud everywhere. We opted to replace it with a Koyo aluminum racing radiator which bolted right in, and actually gives us an increased cooling capacity, which would most likely come in handy while turning hot laps in the summer heat. And since we were there all ready, we put in some Samco Silicone Radiator hoses too. Then there are brakes. If you have an otherwise stock car, you can still head out to the track and have a great time, but the one weak link that must be addressed is your brakes. With repeated hard use, you put a substantial amount of heat into your brake system which can cause it to begin to fail. This is referred to as “brake fade”. At worst what this means is that you will mash the brake pedal to the floor, your car won’t slow down, and you head off track into the weeds. There are two main causes for this, first is that you heat up your brake pads beyond the range that they were designed to operate, and the second is that you put enough heat into your fluid that it boils. Boiling your fluid means that there are bubbles of gas trapped in your lines, which are easily compressed. This is generally the more common failure, but both areas need to be addressed. For our car, we went with Goodridge Stainless Steel Lines to improve pedal feel (and let us detect fade sooner), with ATE Super Blue Brake Fluid. The Super Blue is a DOT 4 brake fluid, which has a higher boiling point than the stock DOT 3 Fluid. For pads, we went with the Hawk HPS pads on all corners which give us a higher operating temp, and much better initial bite. Lastly, we put Powerslot Cryo-treated rotors on the front. The slots in the rotors scrape the pads to reduce the chance of glazing, and also reduce the chance of hot gasses building up a cushion between the pad and the rotor, which can also reduce the brake’s effectiveness. Well, as you may have guessed, after putting all this energy in improving our brakes and suspension, we couldn’t bear to leave our engine in stock trim. 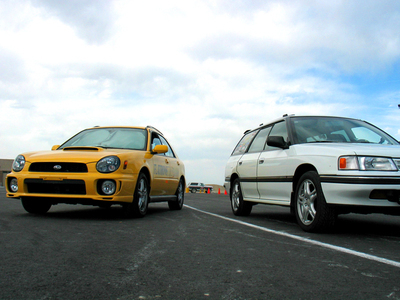 I am actually going to write another entry dedicated to dynoing the car and the results that we had. I will tell you that we put on a Go Fast Bits WRX Hybrid By-Pass valve, Prodrive Flex Up-Pipe, and the MRT 3” exhaust from my old WRX. For engine management, we went with the Cobb Access Port of course, and got a custom Pro-Tune from Kris Graham at logic Imports. All this gave us 210 whp, which was quite a jump up from the stock 169 whp that the car put down before we started messing around. Overall, we were very happy with this set up. The car had plenty of power, and was very neutral in the corners. We did go with a slightly more aggressive alignment with a some toe-out up front, and none in the rear, and -1 degree fo camber up front and -.7 degrees in the rear. The brakes were definitely up to the task of stopping the car at the track. There was only minor fade towards the end of the 20 minute sessions that we were running. And on the street, this set up inspires a great deal more confidence than the stock pads, etc… If I had the chance to change anything, I probably would have went up to the medium setting on the rear Sway-Bar to give the car a little more turn in, but even at the soft setting it would only under-steer badly if I went into a corner a little too hot. On the street however, the car feels just about perfect, and is dialed in just right for high speed sweepers. Next time, we will go in depth into putting the car at the dyno, with lots of charts to show the increase in Horse Power and Torque at each stage of tune. Lastly I just have to thank Jamie Miller and Kris Graham because they both were a huge help with getting the car ready for its day at the track. Great info here! I am just starting the brake and suspension upgrades on my 2005 WRX wagon. This was easily my year of choice because of its most aggressive body style. However I would've appreciated the WRX stock brake upgrade a year sooner! I am doing the 4-pot this month, and plan on the suspension upgrades you mentioned in this article as a next phase. My brake upgrade is as follows and tips are appreciated! Subaru 4-pot calipers in front with Hawk HPS, stock calipers in rear with EBC redstuff pads, goodridge lines (after searching, it seems this is all anyone ever uses! ), Brembo OEM blank rotors, DOT 4 fluid, and of course caliper paint on the rear to match the front. stoked! First and foremost, I would like to congratulate you guys on the testing! It's a success. You've found ways to check the integrity of the brakes, engine and fuel-efficiency of the car. It's all about maintenance and proper handling.